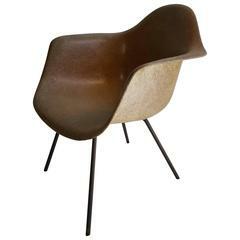 Early Salmon color Charles and Ray Eames Arm Shell Chair, 2nd generation. X base. Amazing condition, retains clean, crisp gel coat, large domes of silence shock mounts and solid iron X base, stunning!